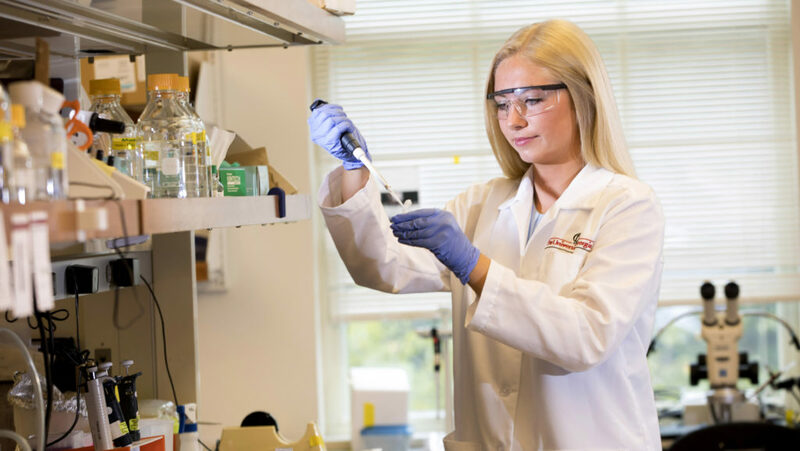 Katie Irwin’s passion is advancing science not only through her own work studying neurodegenerative diseases, but also through helping encourage others — especially young girls — to pursue successful careers in STEM fields. My older brother Andy attended UGA as well, so even though my dad graduated from Georgia Tech, we can still convince him to cheer for the Dawgs sometimes. My time here at UGA has been defined by opportunities I had never imagined, a wonderful sense of community, immeasurable personal growth, and great mentorship along the way. During my freshman year, I was able to join Jim Lauderdale’s developmental neuroscience lab in the department of cellular biology. In the lab, I direct my own project comparing the development of the lizard third eye, also known as the parietal eye, to that of the lateral eye to provide a unique system for gaining insight into the formation of vertebrate photoreceptive structures. I have presented my research at multiple symposia, including the annual CURO Symposium, where I received a 2017 Best Poster Award out of 290 posters. This past May, I was also able to present my research at the international 2018 Association for Research in Vision and Ophthalmology Annual Meeting in Honolulu, Hawaii. When not listening to scientific presentations concerning the eye or discussing my research with experts in the field, going on stunning hikes around Hawaii was a blast. Overall, training in the Lauderdale lab, I have not only acquired important research techniques but also have learned how to think like a scientist through the guidance of Dr. Lauderdale and my graduate-student mentor, Ashley Rasys. Within neuroscience, I am particularly interested in brain aging and neurodegenerative disease. While I love my work in the Lauderdale lab, I have utilized my summers to explore my research interests in neurodegeneration. Funded as a UGA Honors International Scholar, I traveled to Dublin, Ireland, during the summer after my sophomore year to work as a research intern at the Global Brain Health Institute at Trinity College. The GBHI is committed to training a network of international leaders in brain aging in order to reduce the worldwide impact of dementia. There, I worked under Dr. Lorina Naci and wrote as first author a literature review examining evidence for cognitive and structural brain changes that may differentiate healthy aging and pathological aging related to Alzheimer’s disease in midlife. This review has recently been accepted for publication in Frontiers in Aging Neuroscience! Additionally, I attended GBHI seminars as one of only two students among a room filled with GBHI Fellows, experts in diverse fields recruited from around the world. These discussion-based meetings involved presentations concerning research in a variety of topics relevant to brain aging. Beyond learning so much about Alzheimer’s disease and other dementias, I had the best summer exploring the beautiful country of Ireland. The charming culture, incredibly kind people, astonishingly green countryside, and rugged coastlines combined to create two months I will never forget. Having loved my time at the Dublin base of the GBHI so much, I returned to the GBHI for the summer following my junior year, but at its other base at the University of California, San Francisco. In the UCSF Memory and Aging Center, I worked under Dr. Lea Grinberg to continue studying Alzheimer’s disease. In the lab, I investigated the pathology of Alzheimer’s disease in postmortem human brain tissue through immunohistochemistry and employed cell culture techniques for the study of neuronal cell death pathways. I adored exploring the steep streets of San Francisco (and getting quite the workout while doing so) as well as the beautiful coastal landscapes just across the Golden Gate Bridge. Combining funds from various UGA awards made my travels possible: the Dr. and Mrs. Larry A. Cohen Scholarship awarded to a premedical student in the Franklin College of Arts and Sciences; the Hollingsworth Award presented to the best undergraduate student in each section of MATH 3000, 3100, 3200, 3300 and 3500/3510; the Claudia Shamp Scholarship awarded to a member of Order of Omega; and the Carole Middlebrooks Merit-Based Scholarship presented to four Panhellenic women. Other noteworthy travels during my time at UGA include the Discover Abroad Maymester in New Zealand and Australia, on which I embarked immediately following my freshman year. I had been dying to visit New Zealand for years, so I did not waste any time signing up for the trip as soon as my first semester at UGA began. The trip exceeded all of my expectations. Swimming with hundreds of wild dolphins above a deep-sea canyon in the chilly South Pacific, taking the polar plunge underneath snowy Mount Cook, diving into a blurred weightlessness at New Zealand’s tallest bungee jump, eating far too many scones in a small cabin hidden in the wilderness of Doubtful Sound, gazing at the Milky Way in the Australian Outback, and scuba diving with sea turtles in the Great Barrier Reef are only some of this Maymester’s highlights. The spectacular landscapes of New Zealand and Australia provided the perfect backdrop for learning about both animal behavior and sustainability, the two topics my cohort explored during our travels. Enjoying these experiences alongside many new friends made the month even more memorable. Aside from these cross-country and international adventures, my time in Athens has been incredibly formative. In addition to conducting scientific research, I have found gratifying clinical exposure through volunteering at Athens Regional Medical Center and St. Mary’s Hospice House. Additionally, I have enjoyed being a member of UGA Miracle’s Hospital Relations (HR) Committee since my freshman year, serving two of those years on Miracle’s Leadership Team. Being on HR has impacted me more than I thought possible, as the touching moments I have had the privilege of experiencing on visits to Children’s Healthcare of Atlanta have changed my perspective on gratitude, given me a lesson in bravery, and even altered my future, as I have learned that my heart is in the hospital, changing my path from pursuing neuroscientific research only to desiring to treat patients as a neurologist as well. Furthermore, my fellow Miracle members have continually inspired me by their commitment to our cause and by the way they invest not only in the hospital and the Miracle families, but in each other as well. Another organization that has been special to me during my time at UGA is the Undergraduate Neuroscience Organization. I served as vice president my sophomore year and have served as co-president for the two years since. Working with multiple executive boards to expand UNO has been very rewarding. Last year, I was able to create and plan the inaugural Georgia Collegiate Neuroscience Symposium, hosted at UGA, which received submissions from students of five different universities. Watching students from around the state enthusiastically discuss their research with each other was incredibly gratifying. With UNO, I also have been able to teach neuroscience to local third-graders through our Neuroscience 4 Kids program and help raise money for the Michael J. Fox Foundation for Parkinson’s Research. In addition to the ambitious and impressive individuals with whom I’ve been lucky to work in UNO, involvement in Alpha Omicron Pi, the Honors Program Student Council, the Dean William Tate Honor Society, and Omicron Delta Kappa has allowed me to grow alongside some of the most passionate and accomplished individuals at UGA, by whom I am constantly inspired as well as encouraged. These opportunities made available to me by UGA have exceeded anything I could have imagined for myself at the beginning of my journey here. Faculty, mentors and peers have given me the direction, encouragement and confidence to abandon my comfort zone to chase these opportunities. Beyond the knowledge I have gained here, this university has taught me lessons, instilled in me values and cultivated personal attributes that will inform how I walk throughout my day even after I have passed under the Arch. Growing up, I actually never planned to attend UGA. I always imagined myself attending college outside of Georgia, but after my older brother came to UGA, I observed the sense of community and array of opportunities he found here. I started considering UGA more, and no matter how hard I tried to convince myself to stick to my out-of-state plan, some unspoken sense of home that I felt at UGA kept pulling me back. And I’m so glad it did! I eventually realized I couldn’t turn down the combination of electric school spirit, a familial campus community and a very affordable education in a top-notch Honors program. I like to slow down my typically chaotic days for a couple of minutes by finding a bench to sit on, listening to my favorite songs through my headphones, and soaking up the beauty of our campus. On a less mellow note, I also love getting far too competitive in intramural soccer leagues. … being with my friends, playing a pick-up game of soccer or finding a treat to satisfy my sweet tooth (Cookout milkshakes, DQ Blizzards and Last Resort cheesecake are some of my favorites). I love being outside, so if I have a pretty free weekend (this is a rare occurrence, though), taking a trip to North Georgia for a hike is ideal. … live alone in Dublin, Ireland, for 2 months! I was intentionally springing out of my comfort zone by setting up a summer research internship in a country in which I knew no one, but I landed much farther outside of it than planned. I had anticipated an abundance of other students and interns to befriend in Dublin; instead, the other rooms of my “apartment” remained empty all summer, save for one or two professors moving in for a couple days and then returning to their home countries, and only tour groups and faculty walked Trinity College’s cobblestone paths. Thank goodness another UGA student (shout out to the wonderful Tarun Daniel) happened to contact the same Trinity professor as me, and we were able to bond as the only two students working among the physicians and researchers at the Global Brain Health Institute based at Trinity College. However, since we lived so far apart in Dublin, much of my time outside the office was still spent alone. One of my favorite memories from that summer is my solo trip to Ireland’s Aran Islands during one of my first weekends in the country. During this trip, my first time sightseeing alone, I learned the value of engaging people whom I might not have had I been caught up in the comfort of a travel partner. On the train ride to Galway, I discovered from another passenger what life was like growing up on a struggling sheep farm. At my hostel, I met an American woman who reminisced on her favorite memories with her daughter, of whom she said I reminded her. (A month later, I ran into this same woman again on a mountaintop in Switzerland.) Then, having ferried from Galway to Inis Mór, the largest of the Aran Islands, I absorbed some of a new language after being adopted by a French tour group biking the same hilly path as me. Once I reached my destination of the coastal fort Dun Aonghasa, I sat alone on a cool gray slab of stone, looking behind me at hills of implausible green and then back ahead at the dark navy Atlantic churning 300 feet below, slamming into the side of the cliff on the edge of which I probably perched too precariously. I remember this moment very clearly, as there, gazing at the more peaceful horizon and evaluating the vastness of the ocean I had crossed in pursuit of learning more about the worldwide scale of dementia at the GBHI, I reflected on the freedom and adventure I had already found in learning both how to be alone and how to appreciate anyone with whom I come into contact. The confidence I deepened, stories I collected, and open-mindedness I cultivated that summer by exploring without any filters are irreplaceable. I now take care to deeply understand the rareness of every place I encounter and person I meet. … in my bedroom wrapped up in a blanket. If I need to be slightly more productive, I’ll move downstairs to the living room. And when I need to be even more productive still (MCAT season was pretty much the only time I frequently resorted to this), the science library is my go-to. Ever since going on commuter meal plan, I’ve also become a huge dining-hall studier. During finals week, you’ll find me with my laptop open in Bolton for hours on end. I can’t pick just one, of course! John Maerz led my cohort for the Maymester in New Zealand and Australia, teaching a course in “Animal Behavior,” and is one of the best professors I have had. He is a challenging yet approachable instructor and effectively engages each of his students in the material whether they have a scientific background or not. He communicates complex concepts in an incredibly clear manner and teaches from a wealth of knowledge that extends far beyond his own field. Dr. Maerz is also a very caring professor who is invested in the success of each of his students. When I was endeavoring to host a neuroscience symposium at UGA, Dr. Maerz went out of his way to help me solve logistical issues even though the event had nothing to do with his own department. Another professor who has been influential during my time at UGA is Dr. Karl Espelie. I met Dr. Espelie later in my career than most of his advisees typically do, not until my junior year, but he has already provided me immense support and guidance on my premedical path. It did not take long for me to be blown away by the amount of time Dr. Espelie devotes to his students and the care with which he invests in their dreams. Finally, I have great appreciation for Jim Lauderdale, the principal investigator of the lab in which I have worked since freshman year. Dr. Lauderdale has allowed me great autonomy in the lab by giving me my own project, pushing me to be a better scientist by trusting me with independence I did not know I would have as an undergraduate researcher. He has invested in the advancement of my research career, encouraging me to submit my work to an international conference, for example. In addition to learning from Dr. Lauderdale in a laboratory setting, I took his neurobiology course, which is my favorite class I’ve taken so far at UGA. Dr. Lauderdale is an excellent lecturer and sincerely wants each of his students to succeed. He engages students’ critical thinking skills in a way that ensures comprehensive understanding of the material rather than mere memorization. Additionally, Dr. Lauderdale has been a valuable resource for the Undergraduate Neuroscience Organization, particularly by taking time out of his busy schedule to help me organize the Georgia Collegiate Neuroscience Symposium. … Santiago Ramón y Cajal, who is considered the father of modern neuroscience and who won the Nobel Prize in 1906. Ramón y Cajal proposed that the nervous system is made up of individual cells when most scientists believed that it instead constitutes a continuous network of interconnected fibers. I would love to hear about the early exploration of the nervous system and Ramón y Cajal’s experiences challenging a widely accepted scientific theory. … find a cure for Alzheimer’s disease! Alzheimer’s disease causes a devastating burden on the individuals affected, their loved ones, and the health care system at large. With the growing aging population, this burden is increasing worldwide, and there are still no therapeutics that effectively modify the progression of the disease’s underlying pathology rather than only slightly and temporarily relieving its symptoms. Then, I would become a part-time nature/landscape photographer (while still maintaining my career as a physician scientist). I don’t have much artistic ability, but I adore landscape photography. Each year, I customize an agenda book with beautiful images of my favorite places in the world on the covers, keeping my very long to-do list inside from stressing me out, and similar prints cover one of the walls in my bedroom. They fill me with serenity while simultaneously humbling me with awe at the elegance and enormity of Creation. I would love to be able to capture these images myself and share the beauty of our planet with others. Being able to travel the world, trek to isolated yet breathtaking spots in nature, and explore other cultures along the way would be a dream. First up on my list: the Faroe Islands, Iceland, Patagonia and Antarctica. … ensure access to high-quality education for people all over the world. My education has opened so many doors for me and has allowed me not only to dream big but to confidently and assertively pursue those dreams as well. I wish everyone could enjoy such educational opportunities, which promote self-dependence, improved health, expanded horizons, an understanding of the past and a readiness to change the future. 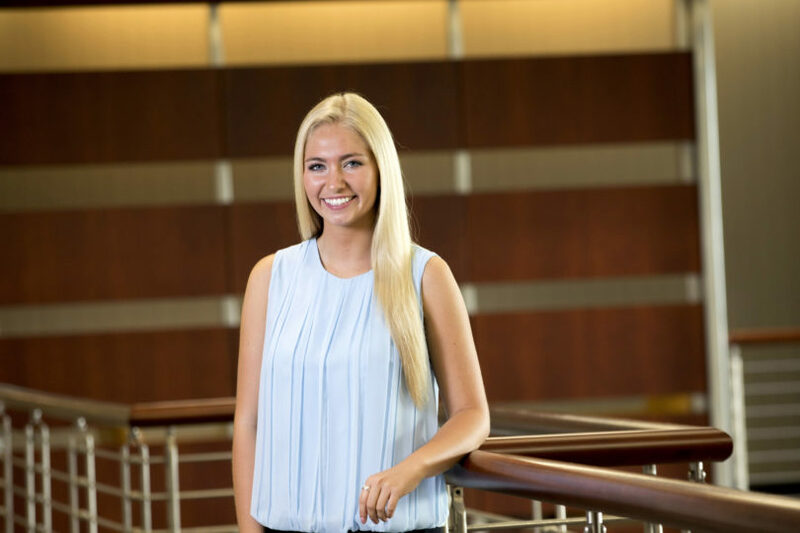 My passion is advancing science not only through my own work studying neurodegenerative diseases in the future, but also through helping equip others to pursue successful careers in the sciences. In particular, it is important to me to encourage young girls to pursue careers in STEM fields. Women have become equally represented in medical school and M.D.-Ph.D. program admissions and have become better represented in some STEM graduate program admissions as well, but the same is still far from true for science’s highest levels of leadership. A host of hurdles or barriers may hinder women’s leadership in STEM fields, and one of these may be a lack of female role models and mentors currently in such leadership positions. I, however, during my summers at the Global Brain Health Institute in Dublin, Ireland, and in San Francisco, California, was able to work under female principal investigators who are trailblazers in their fields and also balance happy family lives, and I learned from these women the importance of unapologetic confidence and grit. I aspire to continue pushing back barriers for women in STEM leadership, or leadership positions in general, and hope to participate in programs during my career that instill self-confidence in young girls, many of the world’s future leaders. … begin an M.D.-Ph.D. program to become a physician scientist! Hopefully I will have a month or two to relax and potentially travel, however, before embarking on my eight years of training. I am currently interviewing at various programs, so I have no idea yet where I will end up, but I am looking forward to the exciting, albeit long, path ahead! In my career, I plan to conduct research on neurodegeneration, focusing on the molecular pathology of Alzheimer’s disease in order to identify new therapeutic approaches, as well as treat patients as a neurologist. In the physician-scientist role, I will have the privilege of helping patients of both the present, through clinical interactions, and the future, through scientific advancements. … not a single event, but rather a single tradition. To raise money on UGA Miracle’s $100 Day, my friend Regan Lochmandy and I each year promise to dress up in an absurd costume for an entire game day, including in Sanford Stadium, if we both meet our fundraising goals. So far, we have run around tailgates dressed as hot dogs, danced on national television as Katy Perry’s famous left and right sharks, and gone *nuts* for the Dawgs in inflatable squirrel costumes. With multiple television appearances as well as many more Jumbotron features, we are committed to embarrassing ourselves FTK once again for our fourth and final year; stay tuned!